• Leftover worsted weight yarn in your school’s colors. 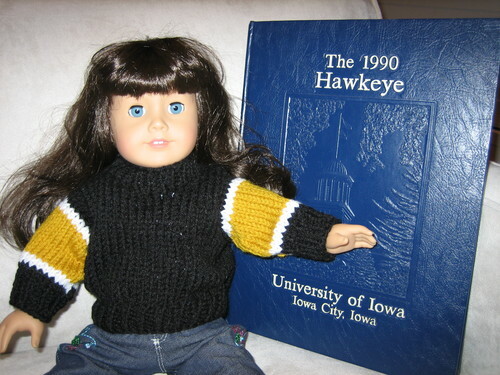 I used black (MC), white (Color 2) and gold (Color 3) for the University of Iowa sweater. • Provisional Cast On Color – This yarn is also a worsted weight acrylic yarn in a color so completely opposite from the yarn colors of your sweater so as not to be confused for the actual sweater. This is only a place holder and will be ripped out at various stages of the knitting. Using US Size 8 dpns, cast on 20 stitches using the provisional cast on colored yarn. Switch to Main Color (MC) and continue to knit in stockinette stitch for 2½ inches or 7 cm. End on a knit row. Using the knitting cast on method, cast on 2 stitches and purl across (22 st). Using the knitting cast on method, cast on 2 stitches and knit across (24 st). Repeat these two rows one more time (28 st). Insert the needle from top-to-bottom, right to left and pick up 5 stitches. Cut off the provisional cast on yarn ONLY above the 5 picked up stitches. Tie a knot in the leftover provisional cast on yarn so that you don’t lose the center stitches. Repeat for the other shoulder. You should know have 5 stitches on the left needle, 10 stitches in the center still connected to the provisional cast on yarn, and 5 more stitches on the right needle. If you prefer, you can put one of the sides on a stitch holder and work one side at a time. Row 1 – Knit across (5 st). Row 9 – Using the knitting cast on method, cast on 4 stitches. (12 st). Do not knit. Set aside. Row 1 – Purl across (5 st). Row 6 – Using the knitting cast on method, cast on 1 stitch. Knit across. (6 st). Row 8 – Using the knitting cast on method, cast on 2 stitches. Knit across (8 st). Row 9 – Purl across. DO NOT CUT YARN! You are now ready to connect the front neckline. Row 10 – With the yarn from the left front, continue to purl across the right front, connecting the left front shoulder to the right front shoulder. You should have 20 stitches. Row 15 - Using the knitting cast on method, cast on 2 stitches and knit across. (22 st). Distribute the 56 stitches for the front and the back evenly on 3 dpns. Being careful not to twist, join the front to the back. Pick up the yarn from the back and continue knitting around for 2 ½ inches or 7 cm. (56 st). • Switch to US size 6 dpns and knit around. Knit in K1, P1 ribbing around for 1 inch (2.5 cm). Bind off loosely. Using the MC (black) and US size 8 dpns and the CC, pick up 28 stitches evenly along the armhole. • Knit in the round using for 3 rounds. • Switch to Color 3 (gold) and knit 12 rounds. • Switch to US size 6 dpns and decrease 8 stitches evenly around sleeve (K1, K3tog, *K2, K2tog – repeat from * to end). Picking Up Neckline Stitches – Using the US size 6 dpns, pick up the 10 stitches from the back of the neck stitch holder. Cut off the provisional cast on yarn. Pick up 40 stitches evenly along the rest of the neckline beginning at the left front of the neckline. (50 st). • Knit in K1, P1 ribbing for 1 inch (2.5 cm). Weave in any loose ends for entire sweater. Block. All graphics, patterns, text, and content on this site are the sole property of Jennifer L. Jackson. The pattern may be printed for personal use only. The pattern or any finished product made from this pattern may not be used for commercial purposes.